Gandhinagar: Gujarat Chief Minister Mr. Vijay Rupani today reached out to Non-Resident Gujaratis (NRGs) settled in America through videoconferencing with an appeal to financially support Gujarat’s Jan Sanchay Abhiyan to conserve rainwater to last till next monsoon. He was linked to NRGs assembled in the USA to celebrate Gujarat’s Foundation Day. It was early morning here and evening in America. 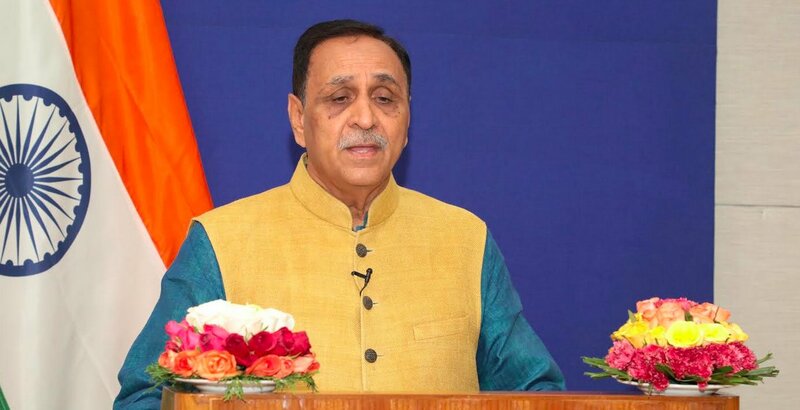 Congratulating all Gujarati families in America to mark Gujarat Gaurav Divas, Mr. Rupani listed all round development of the state during the last 22 years – be it agriculture or industry, trade or commerce and even policing – by application of latest technology with zero tolerance towards corruption. He said the month-long statewide Jal Sanchay Abhiyan was launched on Gujarat’s Foundation Day on May 1 last, to deepen 13,000 village ponds, revive 32 rivers and cleanse network, create additional water storage capacity of 11,000-lakh cubic feet with people’s cooperation, and use the clay dug up as fertile soil for farming. Mr. Rupani said that Gujarat’s living abroad are known to be concerned about developments back home. The Gujaratis’ dominance in America in intellectual fields like health, education and technology is also increasing. He appealed to them to extend financial and all possible support to this massive campaign for their motherland, in their respective village, taluka and district. He invited NRGs to participate in the next biennial Vibrant Global Summit to be held here from January 18 to 20, 2019.